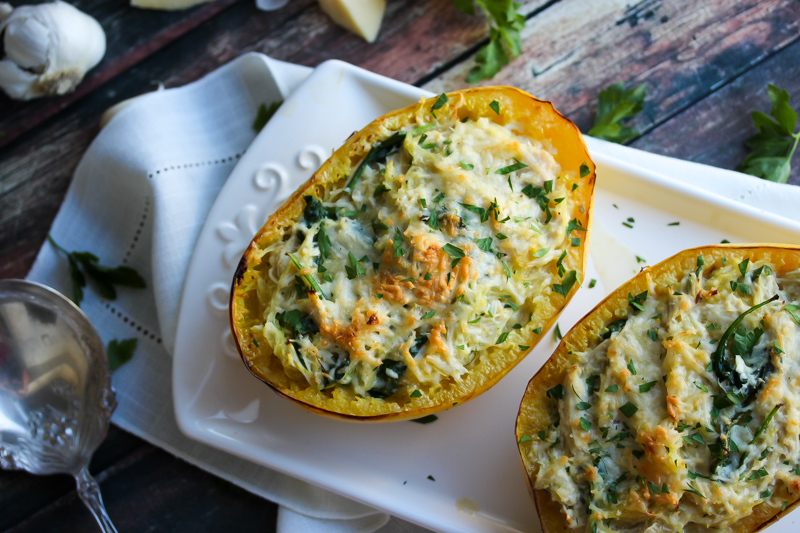 An Italian staple lightened up and stuffed in a spaghetti squash boat! This may become your new favorite way to eat chicken alfredo while cutting down on more than half the calories and fat content. Current status: swooning over this faux recreation. Alfredo is something I really never order because 1. I’m way partial to red sauce, and 2. It sits in your stomach like a brick for 5 hours and that leaves no room for dessert. Feel me? However, I can’t sit here and say it’s not delicious. It most definitely is. In all of it’s rich, silky, garlicky, cheesy goodness. Emphasis on the garlicky. GAH! So how the heck do we make a super light and flavorful, yet deliciously creamy, alfredo sauce?? What kind of black magic is this? For starters, we subbed the traditional heavy cream for cashew milk! I’m completely obsessed with using cashew milk in smoothies, sauces and creamy soups. It’s the creamiest of nut milks and has a nice smooth, neutral taste. Cashew milk is also full of nutrients, like magnesium, phosphorus, iron and potassium. The fat in cashews is mostly unsaturated and they are also a good source of protein. The sauce is also enriched with plenty of fresh garlic, shallots, herbs and parmesan cheese (of course). Some things you just can’t substitute! I also snuck in some fresh baby spinach because I’ll use any opportunity to add more greens, but that’s totally optional. We served these squash boats with grilled multigrain Italian bread and simple side salads and it was such a perfect meal. We ate the “spaghetti” right out of the squash boat which, I don’t know about you guys, but I find to be so damn enjoyable. A super light summery meal that feels comforting and satisfying, yet is low in calories and packed with fiber and protein. What’s not to love?! I hope you guys try this fun rendition of chicken alfredo and enjoy it as much as we did! If you make this recipe, be sure to snap a photo and tag #dishingouthealth so I can see your beautiful creations! 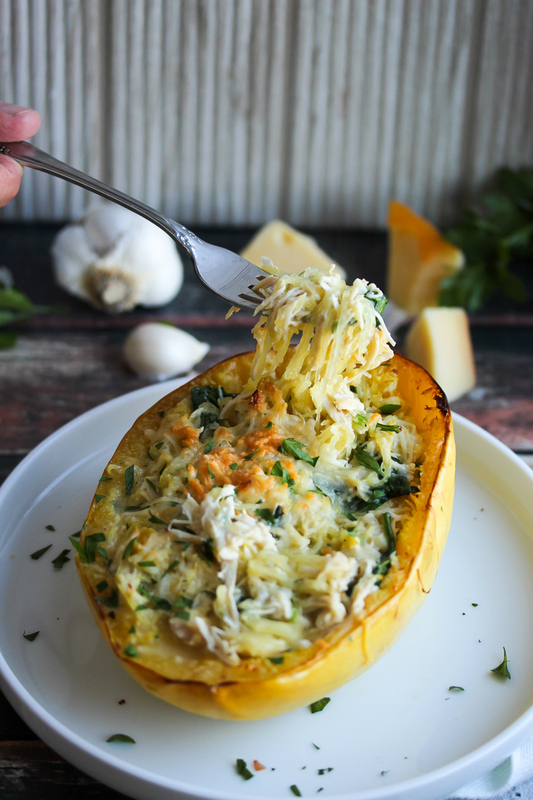 Skinny Chicken Alfredo Stuffed Spaghetti Squash is a delicious spin on the beloved Italian staple! This easy recipe is low in calories and high in fiber and protein. Your family will love it! Use a large knife to cut the spaghetti squash lengthwise from stem to tail. Rub the flesh with olive oil or lightly coat with non-stick cooking spray. Lightly season with salt and pepper and place cut-side down on a baking sheet. Bake for 45 minutes. Remove from oven and allow to cool for 10 minutes before handling. Turn oven broiler to HIGH. While the squash cools, heat 1 Tbsp. olive oil in a large skillet over medium heat. Add shallot and a pinch of salt and pepper; cook for 2 to 3 minutes, until softened. Add butter and garlic; cook until aromatic, about 1 minute. Whisk flour into garlic butter mixture continuously for about 30 seconds until well-combined. Add milk and increase heat to high, bringing mixture to a low boil. Once boiling, reduce heat to low and let simmer for 5 minutes, until mixture starts to slightly thicken. 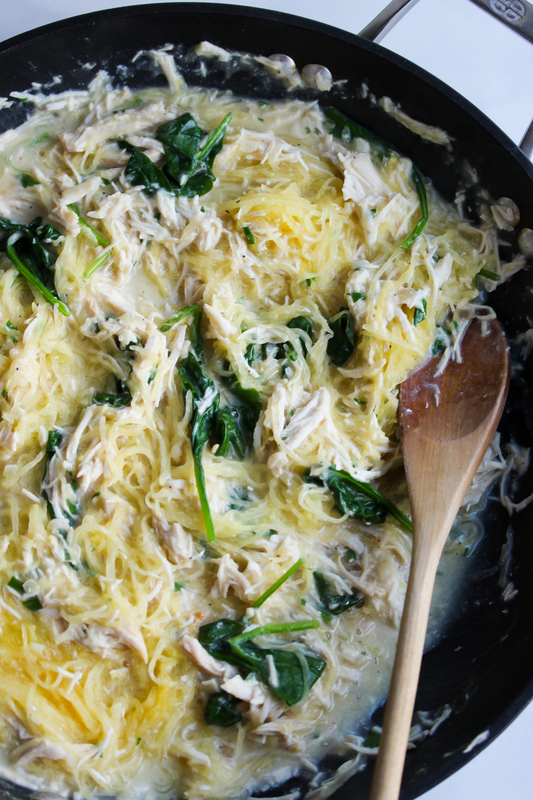 Scrape out and discard the seeds of the spaghetti squash. Scrape out all the spaghetti-like strands to be incorporated into the Alfredo mixture. Add chicken and spinach to skillet, stirring until spinach wilts down. Add the squash strands, 2 Tbsp. of the Parmesan cheese, and parsley. Mix until well-combined. 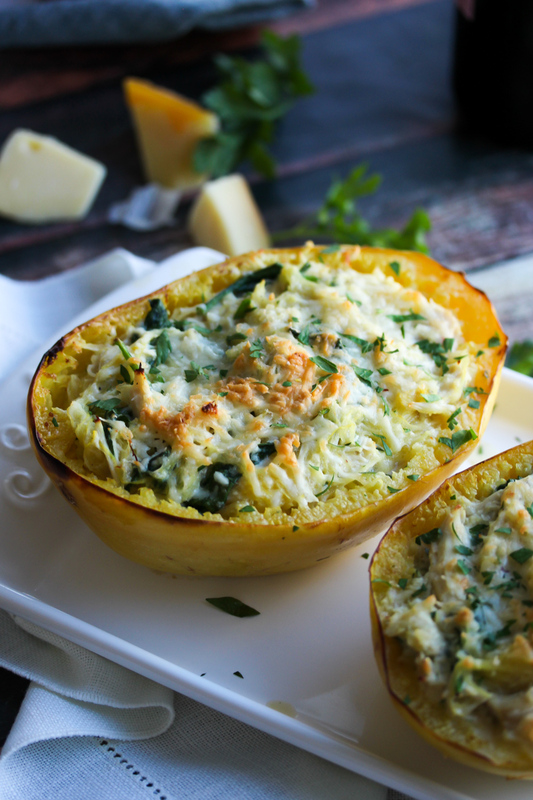 Fill squash boats with chicken Alfredo mixture, dividing evenly amongst each half. Top with remaining parmesan cheese (1 Tbsp. per boat). Broil on HIGH, checking every few minutes, until the cheese is melted and slightly crisp, about 5 minutes. Garnish with additional parsley. I made this recipe tonight and it was delicious. I had to simmer the coconut milk mixture a little longer than the recipe called and I doubled the parmesan cheese. I was pleasantly surprised how good it was as I am a creamy yummy deliciousness fan. Hi Jeannie—I’m so glad you enjoyed this recipe! Thanks for letting me know about the adjusted simmer time. Hopefully you’ll include it in your rotation again soon! Is it possible to just use regular milk? Made this tonight, and it’s a good base recipe. I was really surprised at how well the cashew milk worked though! After tasting the mixture before stuffing the shells again it needed a lot, there wasn’t a lot of flavor but a very basic creamy flavor. Great to start with though as you can spice this up any way you’d like. Can this be modified with unsweetened Almond milk instead of the cashew milk? Serving size 1/3 of recipe?? Seems awkward if eating this from the “boats” as recommended. Any clarification, please? Thanks!!! Yay, that’s amazing!! Thanks for sharing, Meghan! Made my day! Oh my goodness!!! This is so good. I’m so glad I found you on instagram!! Made this for lunch today. Can’t wait to eat it. I tried it after it was done cooking. Delicious! And it was super easy to make. The only thing I changed was the cashew milk to almond milk. I had a new thing of almond milk & decided to use that. Still yummy!!! Thanks Jamie. Yay, so thrilled to hear that, Catherine! Thanks for coming back and sharing the positive feedback! Enjoy! I think this may be my favorite recipe yet…can’t wait to make it! I just happen to have a spaghetti squash in my fridge! That’s awesome, Diane! I’m so glad you liked it!! This looks like pure COMFORT FOOD!!! I love Italian dishes, and this spaghetti version looks like a healthy alternative.